I stopped at the WWII Memorial tonight to see how the construction on the West wall is going. Not so good.! It looks like another month. Hopefully we will have an intact Memorial before long. August is “silly season” and so the news media have been doing their annual stories about whether change is good or bad for DC. In my thirty five years here, it’s been all for the good. And a big shout out to the National Park Service which has some interesting guided tours going on now at night which is absolutely the best time to see DC…at least in this warm weather. As I photographed this same scene in 2004, I never imagined that there would be a WWII MEMORIAL or a DC PHOTO BOOK or an Honor Flight. It’s the constant change and growth that keeps these DC vistas fresh and also worthy of documentation. My DC PHOTO BOOK documents thirty five years of working around the construction to arrive at my vision of a completed town. And even while, it’s under construction, you can make a lovely photograph. The new wrap on the Washington Monument looks great. It was designed by Michael Graves for the nineties work on the Memorial. This time, it has been installed and financed by the Trust for the National Mall, a relatively new organization which has brought not only eighteen million to the National Mall repair table but a lively and hip approach to enjoying the National Mall. 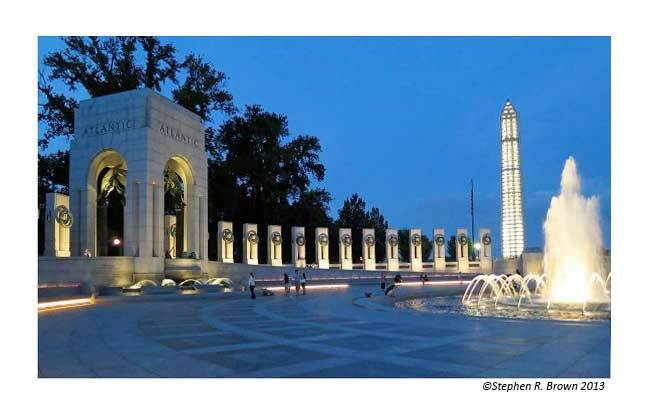 My fantasy is that we will all be drinking lattes as we sit around the new bookstore at the WWII Memorial. The tables would have bases made of tripods! July 31, 2013 | Filed under About the Book, Blogs, Books, DC Photo Book, Honor Flight, Photography, WWII Memorial and tagged with Current Affairs, DC PHOTO BOOK, Memorial Day, National Park Service, photography, veteran, WWII Memorial.